To find my great-great-grandfather Reagan, I went backwards from the last known whereabouts of my great-grandfather. 1850 census had an explanation (as did an email from distant cousin Johnnie Ellen Reagan Edwards). The William in 1860 was the exact right age, but the clincher to the whole deal was that also in the household were John (12-male) and Chas. (8-male), also born in Texas. In the 1975 taped interview with my grandfather, Bascom Andrew "Pop" Reagan mentions that his father had two brothers - John and Charlie ... "but he never talked about his kinfolk much." Bingo! 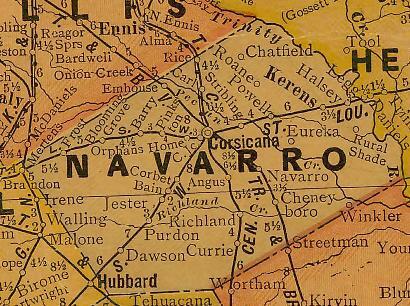 The Navarro County censuses of 1850, 1860, 1870 and 1880 all have this same family throughout, despite the fact that Reagan was spelled three different ways out of the four times and James (J.C.) maybe fudged on his age in 1860. The 1850 cenus has a William A. "Ragen" at age 5. Again, that is exactly the right age. The father's name is James and the mother's name is Emily, who is from Illinois (this turned out to be Emily Spiva). Two young girls also are in the 1850 listing. But no John (who would've been 2 in the previous census). Again, Johnnie Ellen's email provided an explanation. Skipping ahead to 1870, the head of the household is E. Ragan, (35-F). James married Eliza P. Cockrell in 1860 following Emily's death. There are a bunch of other kids, including two twin girls age 8 months, L. and E. That suggested James died right before the census was taken ... which proved to be the case according to the 1870 Mortality Schedule of Navarro County. The 1880 census confirms that the "Regans" listed were the same as those in 1870. The 44-year-old "KeepingHouse" female is named Eliza, and there are the twin girls (L. and E.), aged 9 by then, Laura and Lizzie (short for Elizabeth).